The Caribbean Plate is a mostly oceanic tectonic plate underlying Central America and the Caribbean Sea off the north coast of South America. 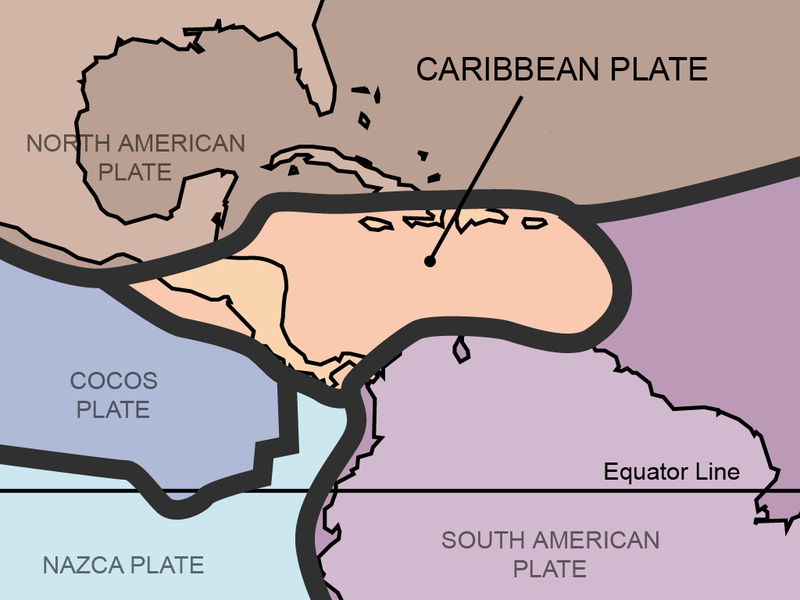 Diversity of tectonic regimes characterizes the perimeter of the Caribbean plate, involving no fewer than four major adjacent plates (North America, South America, Nazca, and Cocos). The Puerto Rico Trench, which is capable of producing earthquakes of magnitude 7 to 8 or greater, faces north and east into the Atlantic Ocean. There are few land areas or islands to block a tsunami generated near the Puerto Rico Trench from entering the Atlantic Ocean. The direction of the waves would depend on many factors, including where in the trench the earthquake occurred. Situated atop three of the large tectonic plates that constitute the Earth's surface, Mexico is one of the most seismically active regions on earth. The motion of these plates causes earthquakes and volcanic activity. Areas of Mexico's coastline on the Gulf of California, including the Baja California Peninsula, are riding northwestward on the Pacific plate. 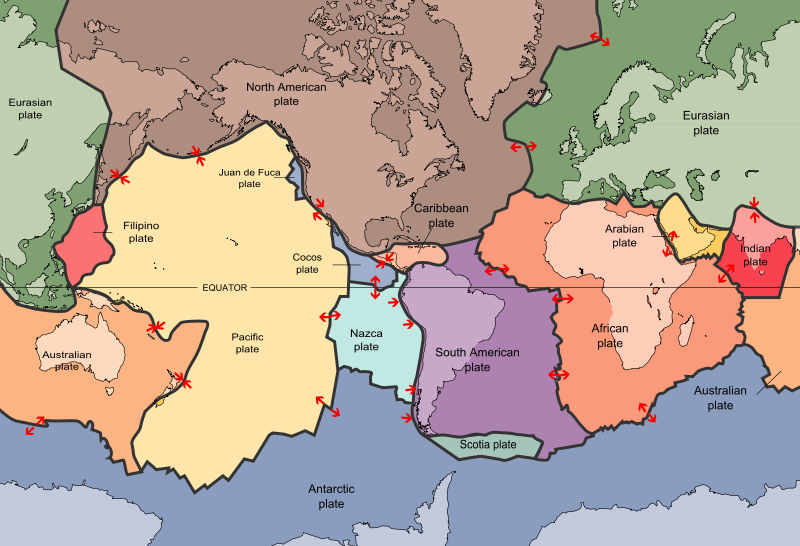 Rather than one plate subducting, the Pacific and North American plates grind past each other, creating a slip fault that is the southern extension of the San Andreas fault in California. Motion along this fault in the past pulled Baja California away from the coast, creating the Gulf of California. 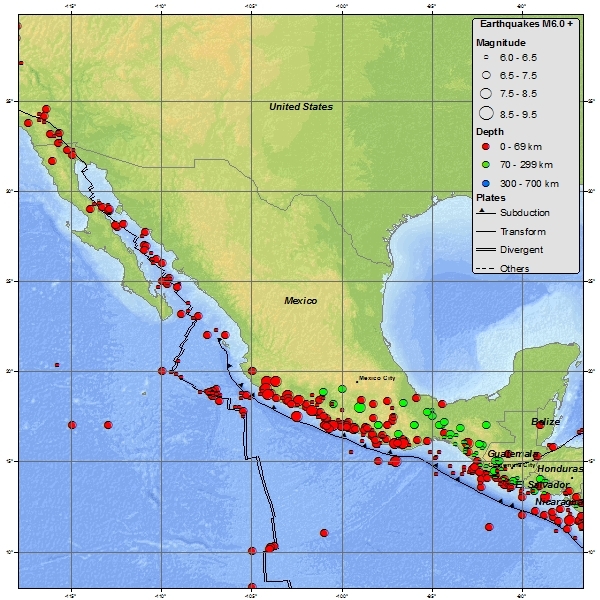 Continued motion along this fault is the source of earthquakes in western Mexico. Mont Pelée, Martinique: most recent eruptions 1929 to 1932; Soufrière Hills, Montserrat: most recent eruption 2010; La Soufrière, St. Vincent: most recent eruption was 1979. The island of Montserrat has a very active volcano and the Government of Montserrat has issued several recent proclamations and warnings urging residents and visitors to be vigilant and to be prepared to move at short notice. Ongoing volcanic activity in the south of the island has led to the evacuation and relocation of residents of the so called ‘exclusion zone' since 1995. Additional evacuations may occur when volcanic activity increases. Because the volcano is still active and dangerous, access to the southern part of the island is restricted. 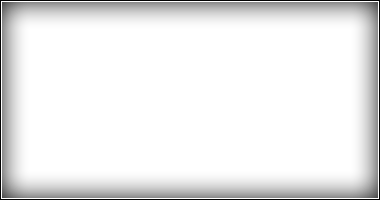 Persons entering restricted areas without authorization are subject to fine and/or imprisonment. In early 2007, Montserrat government authorities warned residents and visitors of volcanic activity and an increase of pyroclastic flows in Tyres Ghaut, Gages Valley and behind Gages Mountain. After placing sections of the lower Belham Valley off limits in January 2007 due to the danger posed by growth of the volcano’s dome, the government of Montserrat lifted those restrictions in September. Access to all areas on the southern flanks of the Belham Valley east of the Belham Bridge and areas south remains prohibited, as is south of Jack Boy Hill to Bramble Airport and beyond. 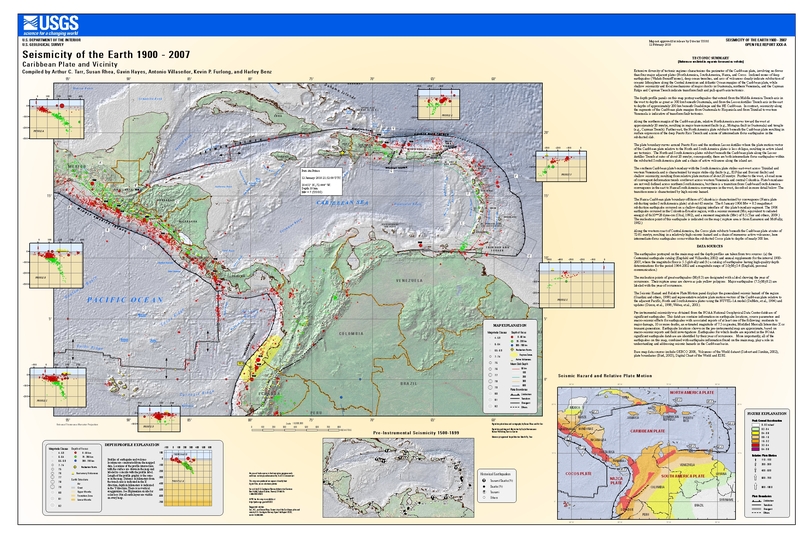 The Caribbean Tsunami Warning Program (CTWP) was established in 2010 as the first step of a phased approach for the establishment of a Caribbean Tsunami Warning Center (CTWC). As funding permits, its staff will continue to grow over the years to meet the requirements of a CTWC.